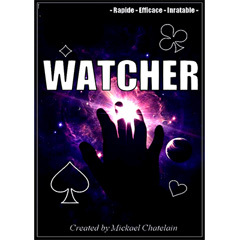 Watcher is really a must-have close-up tool. It takes only a second to learn the card and you can show the card case on all sides - there's absolutely nothing to see! Very easy to do, the accompanying DVD explains absolutely everything. You turn back towards the spectator and explain that you have the memory of an elephant. You take back the pack of the 51 remaining cards, which you quickly look over. You think for a few seconds, and then announce that the one card missing is the queen of spades.